This recipe for these Big Batch Soft Chewy Classic Italian Amaretti Cookies requires no introduction. They are easily recognizable. Everyone knows them. Everyone loves them. And just about everyone is looking for that perfect amaretti recipe. The quest for the best amaretti cookies to complete your Italian cookie tray! There are truly infinite variations for amaretti. As you probably know, you can find them throughout Italy, with each region claiming to have “the best” recipe. Today, I will share a classic version of this chewy amaretti, as well as my experience making this big batch recipe. This classic recipe, by the way, has quickly moved into my top three amaretti recipes. Another one of my top three is this recipe for Soft Amaretti (previously shared with all of you). FULL DISCLOSURE: Unfortunately, I did not have beginner’s luck with this recipe. Heck, it wasn’t until trial run number four that I was beginning to get the results I was looking for. The only reason I didn’t give up was that I knew how delicious they actually tasted! So, I will share my experience in the hopes that you will have beginner’s luck the first time you try this recipe. We all know that we need almonds, ground almonds to make amaretti. So, my quest began with whole almonds and my food processor. The other difficulty I had with this dough was that the coarsely ground almonds would not easily come out of my pastry tip #11. Did I mention that these cookies need to be piped? After about a half-dozen failed attempts, I gave up and switched over to my faithful scooper. Update: I have had a few inquires about the tip I used. Here it is. I have had this thing for ages… honestly cannot remember where I picked this up. Another issue I experienced was that my plastic pastry bag split at the seams… twice. I was putting too much pressure when piping the cookies. Things got a little better when I doubled up on the bag. All of these issues were resolved once I tried the recipe with commercially made almond flour. Just in case you are wondering, I tried Sunblest Almond Flour (not sponsored) available at Costco and Bob’s Red Mill Almond Flour (not sponsored). Both products worked great. The actual recipe comes together in no time. Basically it consists of combining the dry ingredients and the wet ingredients in separate bowls. Then, just add the wet ingredients to the dry and combine together with a wooden spoon. With the help of a pastry bag, you can then pipe the amaretti (round or long) directly on the baking sheets lined with parchment paper. You can also decorate with an almond or if you prefer Maraschino cherries. As you can see, I decided to go with the almonds. A sprinkling of granulated sugar, right before they go in the oven is optional. Another option is a dusting of icing sugar before serving them. This recipe provides you with well over ten dozen cookies sized about 1-1½ inches. That might seen like a lot, but these cookies freeze really well and are convenient to have when friends pop over for coffee. Just in case you are wondering, the recipe can easily be halved. This quest of mine is well supported by friends and family and I am forever grateful to all that continue to share their recipes with me. I have the privilege of working with so many amazing individuals that absolutely love food. There is a fantastic culture of sharing recipes and I have learned so much from so many of my co-workers. It was Maria, one of my colleagues, that shared this recipe with me. I am hoping that you will all experience beginner’s luck when attempting this recipe for these Big Batch Soft Chewy Classic Italian Amaretti Cookies! Your Italian cookie tray is now complete with these classic, naturally gluten-free amaretti. Do you have a favorite amaretti cookie? ★★★★★ If you have made this amaretti recipe, I would love to hear about it in the comments below and be sure to rate the recipe! Your Italian cookie tray is now complete with this recipe for gluten-free Big Batch Soft Chewy Classic Italian Amaretti Cookies. OPTIONAL: a sprinkling of sugar over the tops before they are baked. In a medium bowl, whisk the eggs with the almond extract, Sambuca and the lemon zest. Set aside. In a large mixing bowl, combine the almond flour with the sugar. Add the wet mixture to the dry mixture and combine with a large wooden spoon. Allow the dough to rest for 10-15 minutes. Fill pastry bag with dough. Pipe onto parchment paper with pastry tip #11. Gently press an almond in the tip of the cookie. Sprinkle tops with granulated sugar (optional). Bake for about 22-24 minutes or until bottom is golden brown in color. If desired, switch to broil the last minute to get golden tops. Cool before storing at room temperature in airtight containers (can also be frozen). These cookies just sound like Heaven to me! These look divine! I would love a plate of these with a tea right now! 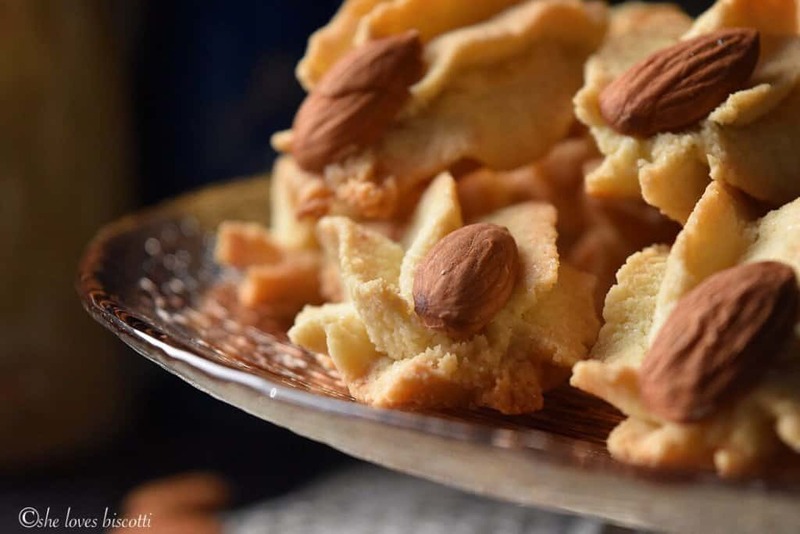 How can a tray of Italian cookies be complete without these soft and chewy Amaretti cookies? I personally love them and I find them so pretty! The almond gives such a nice textural contrast when biting into it. Thanks for the tip about the almond flour vs almond meal, it makes all the difference. I just recently had a taste of my first amaretti cookie at a church fellowship. I loved them so much I took a picture of the bag she brought. Upon finding out they were $15 a bag I decided I can make this cookie! Then I can share and enjoy them anytime I want. I’ve been looking at recipes for about an hour and this one seems far less imtimidating. Would it be alright if I don’t pipe? I dont have that equipment. THanks for the recipe and your trial run work. 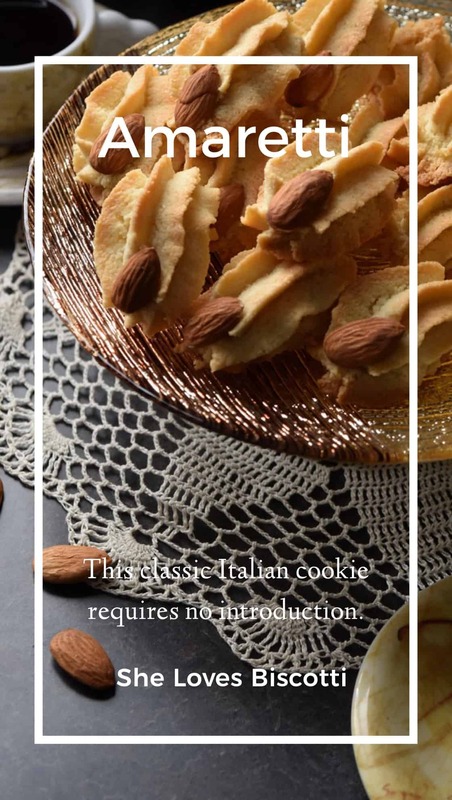 Hi Maria, although I’ve never seen a recipe for amaretti cookies using the whole egg, this recipe looks delicious! Typically, only egg whites are used and beaten till fluffy. I would like to try a small version of this recipe. Thanks for sharing..I too am on a quest for the perfect recipe for these delicious cookies! The frills on the cookies are lovely. 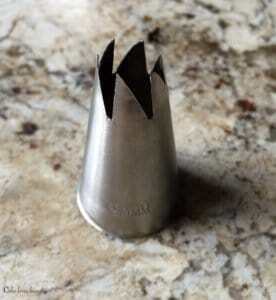 Could you supply the maker’s name of your pastry tip #11? Can the Sambuca be omitted or substituted? Looking for something without alcohol. Thank you! How good do they look! Fantastic. Why do you use Sambuca and not Ammaretto in this recipe?